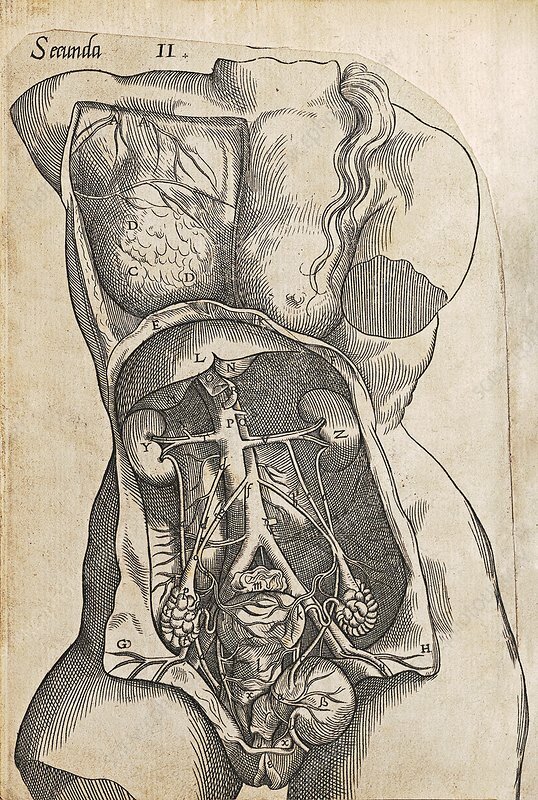 Childbirth anatomy illustration, 16th century. This page is from 'The byrth of mankynde' (1545), a 16th-century edition of a work on childbirth by German physician Eucharius Rosslin (c.1470-1526). The illustration shows the anatomy of a dissected woman, showing the uterus and other reproductive organs. Knowledge of such anatomy was necessary when performing a caesarean section. Rosslin's works helped improve midwifery standards that had been contributing to high rates of infant mortality. His writings were translated into many languages. His original work was written in 1513 in German under the title 'Der Rosengarten' (The Rose Garden). This edition, published in London, was translated from Latin into Early Modern English by physician Thomas Raynalde.